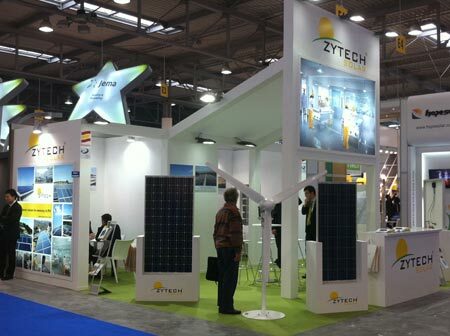 Zytech, the Spanish maker of photovoltaic modules presented its solar photovoltaic power, mini-wind power and LED lighting products at the international Solarexpo & Greenbuilding 2012 fair, in its 13th edition, at Verona’s exhibition centre. Among the company’s highlights for the event were its new high-efficiency cell modules, the new range of 200 to 3000 W wind turbines, its building integrated glass-on-glass modules and a new line of LED lighting products. Zytech Solar presented an attractive photovoltaic catalogue on a corporate stand that was especially designed for the event. The stand, a new design, displayed the latest monocyrstalline and polycrystalline silicon photovoltaic energy technology, and some of the installations built using Zytech modules Italy, Spain, France, Germany, Belgium and Holland. Zytech Aerodyne, the Group’s mini-wind turbine manufacturer, showed its new range of low-power wind turbines, of 200, 400, 1000, 2000 and 3000 W, known for their versatility, robustness and efficiency. Zytech LED, the Group’s new LED lighting manufacturer showed its range of products including street lights, bulbs, tubes and spotlights. These products are installed in combination with photovoltaic modules or in grid-connected installations and save up to 90% in energy consumption. Zytech LED is the first Spanish company to obtain Energy Star certification, the most demanding in terms of durability and performance testing. This has been the fourth time that Zytech Solar participates as an exhibitor at the Verona solar fair, the most important in Italy. This event is creating an increasing amount of interest and anticipation among the public and businesses. As the figures confirm, it is one of the sector’s three most significant trade fairs in Europe on solar PV sector. Over 700 visitors visited the Zytech stand, where they were met by the specialized Zytech Italy trade team during the three days of the event. In previous years the fair has proved to be an excellent means of consolidating and establishing contacts within the sector, after the opening of Zytech Italy’s new commercial branch in Milan.